With so many different brands and models available, it can be a difficult task to find the right one for you. I’ve used a variety of impact wrenches over the years, but three of them stood out among the rest. I’ve used these three wrenches for a lot of different big and small projects, so I am very qualified to give you feedback. I will also provide you with my unbiased opinion about these impact wrenches, so you can understand which wrench you need to help solve the problems you are facing. **Below, you'll see more detailed tested and reviews, but you can also click the links above to see current prices and read customer's reviews on Amazon. What Are These Impact Wrenches Built For? Which is the best cordless impact wrench? How to pick a cordless impact wrench? Each of these impact wrenches has their own advantages and disadvantages, but I agree that each of them have plenty of uses for being the best cordless impact wrench for automotive purposes. We will explain each of the most important features to you and make our unbiased recommendation regarding the top rated cordless impact wrench out of the three. The torque rating is one of the most important features that you have to consider when buying an impact wrench. It tells you how powerful the tool will be, so you can determine whether it fits your needs. At most manufacturers, the torque rating is determined by tightening a nut or bolt at the certain strength and then removing it. This way, the manufacturer can determine the max torque and the breakaway torque. The Dewalt DCF899P1 , the Dewalt DCF899HB , and the Milwaukee M18 impact wrenches are all high torque, which means they produce a max torque of 700 ft./lbs. Both Dewalt models have a breakaway (or nut-busting) torque of 1,200 ft./lbs while the Milwaukee has 1,100 ft./lbs. The differences in the torque rating among these three are very minimal, so all three of these impact wrenches were made for lug nuts removal. I tested each of these impact wrenches on a few different projects. I had to change my tire out on my Ford Super Duty truck and decided to use each impact wrench to take off a different lug nut just to test them out. The lug nuts were 21mm, and I found that both Dewalt models removed them with ease, and I didn't have to put much force on the actual impact wrench at all. The Milwaukee impact wrench still removed the lug nuts, but I had to apply a little extra pressure to get them off. The breakaway torque felt a lot lower than the two Dewalt models, but it was still enough to get the job done. Another test I used on these impact wrenches was when I got new sets of tires for both of my vehicles (the Ford Super Duty truck and a Kia Sportage SUV). When using all three tools, it was clear to me that the two Dewalt models were built to last, since they removed the lug nuts with ease. The Milwaukee was a little harder to control since it only has two speeds. I found that both Dewalt impact wrenches removed both the 21mm lug nuts on the Ford truck and the 19mm lug nuts on the KIA SUV with ease. However, the Milwaukee impact wrench struggled a little bit with the 21mm lug nuts. That may have been the slight difference in the breakaway torque, but it did still remove them after a little bit of added force. With both Dewalt CDF899 impact wrenches, I was able to get the lug nuts to break away easily with the highest speed and torque setting. But once the lug nuts were broken, I shifted it to the lower speed so I wouldn’t put too much strain on my arms. 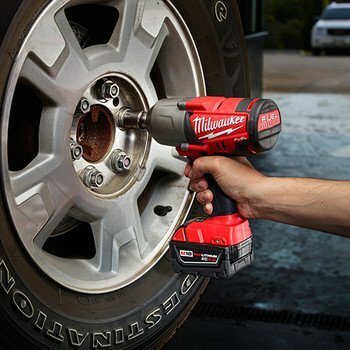 The Milwaukee impact wrench had a harder time breaking away the lug nuts but removed them easily once they were broken. The big difference between the two when installing the lug nuts (both the 19mm and 21mm size) was that I couldn’t control the Milwaukee as much. If I’m going to have to test the tightness of the lug nuts with the Dewalt models anyway, then I might as well use them from the beginning. This is possibly the most powerful cordless impact wrench that is equipped with a 3-speed selector switch to provide you with the ultimate control when you’re working, and it is easy to control. Compact size with a brushless motor which is designed to deliver superior run-time, performance, durability and don’t need to maintain like the brushed motor. This impact wrench will make those tight lug nuts come off with very little effort, so it is definitely regarded as the best cordless impact wrench for changing tires. Even on the lowest setting, you can still expect to be able to remove a lug nut at about 110 ft./lbs of torque. It is one of the most durable impact wrenches that you can own, and it comes with the battery and a carrying case included, so it is one of the most convenient purchases you can make! You will also enjoy a 3-speed selector switch with this impact wrench. It is almost half the weight of the Dewalt DCF899P1, but it is just as durable since it can handle a six to eight-foot drop without breaking as well. One of the downfalls about this product is that it is only sold as the bare tool, which means that the battery and charger are sold separately. You need to keep that in mind when you read the specifications. It is listed as a weight of 5.8-pounds, but it will actually be heavier once you include the battery. The bottom of the tool also includes a bright LED light so you can still see what you are doing when it is dark. Once you install the lithium-ion battery, it is one of the most reliable and long-lasting impact wrenches that you can own. This impact wrench features the REDLINK PLUS Intelligence, which allows you to choose from two different speeds. The DRIVE CONTROL feature also ensures that the impact wrench won’t get overheated, over-discharged and overloaded. And don’t let the 18V of power deter you from buying it. Many people believe that it seems stronger than that and can compare to many other 20V models, so it is widely considered as the best 18V impact wrench. This product is sold with two REDLITHIUM XC 4.0 battery packs, a charger and also a carrying case. You will never have to take a break from working to allow a battery to charge when you have this impact wrench! The type of joint socket that you choose just depends on the type of work you’ll be doing. If you’re a mechanic and have to use multiple sockets throughout the day, then you’ll be better off with a friction or hog ring. The reason why detent pin anvils aren’t as popular for mechanics is because it can be difficult to change sockets. It requires a pin or a screwdriver in order to get the socket out and replace it, so if you have to use more than one or two sockets during a job, it can be a little frustrating and slow you down. Most people will choose the impact wrench with either hog rings or friction rings since they are easier to change out; these are found in both the Dewalt DCF899HB and Milwaukee M18. 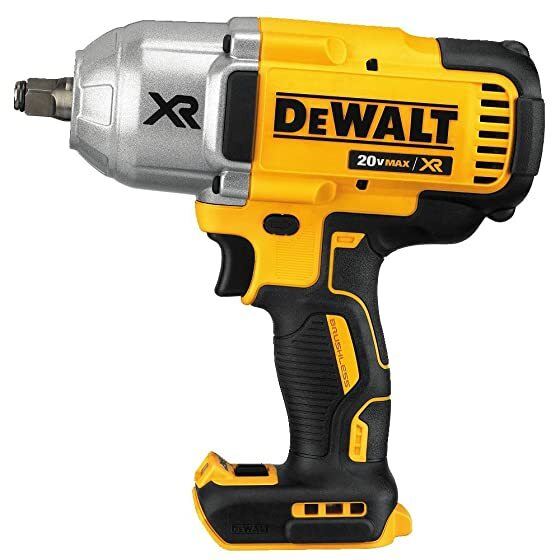 But if you’re going to be using one socket for an extended amount of time, and then getting the Dewalt DCF899P1 with detent anvil will be good as well. As you can see, the dimensions correlate with the weight of the product itself. All three impact wrenches are considered to be lightweight, but when the battery is installed, you can expect an additional 3-4 pounds to be added to the weight. Dewalt DCF899P1 – many people keep this in their toolbox on their automobile, just in case they have to change a flat tire. It will remove lug nuts with ease, and sometimes the top speed is a little too much power. It is a little heavier than the other two models, so it could make you tired if you use it all day. It can be time-consuming to change out sockets with the detent anvil, so keep that in mind if you work on projects that require you to change sockets frequently. 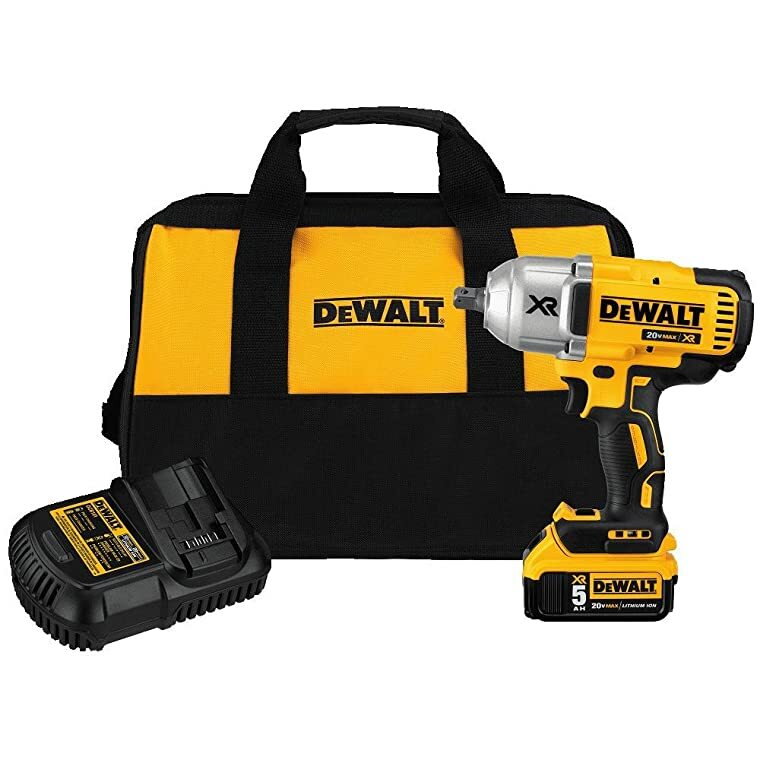 Dewalt DCF899HB – this impact wrench is similar to the DCF899P1 product when it comes to the power it provides. The main difference between the two is that this one uses a hog ring anvil, which makes it much quicker and easier to change out sockets. This is perfect for people who work on multiple projects at once, like mechanics, and need different sockets frequently. 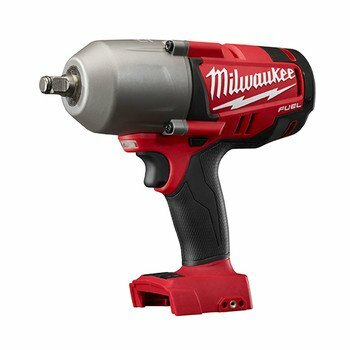 Milwaukee M18 – the durability of this impact wrench sometimes is in question because of the lightweight. However, it can do some of the same jobs that pneumatic air tools can do as well. The torque isn’t quite as strong as advertised, but it will still handle removing lug nuts with ease in most situations. If you’re a fan of the Milwaukee brand, then there’s nothing wrong with buying the Milwaukee M18 impact wrench . It’s great for a recreational worker who won’t use it that much, but the Dewalt models are definitely better overall choices. Between the two Dewalt models, I would recommend choosing the DCF899P1 for a couple of reasons. Since it includes the battery already with your purchase, you are actually getting a better value than if you bought the DCF899HB model . It also comes with a convenient carrying case, so it is more portable! Once you get used to changing out sockets with the detent anvil, it won’t take you very long to change them out each time. Being a fan of the Dewalt brand, I have numerous Dewalt products, and I can say that I like every one of them. I can say with complete confidence that you won’t regret buying either Dewalt impact wrench, but the DCF899P1 definitely gives you the most value and you will be able to use it for many years! Tell us about them how they work if you buy one of them. Other If there three impact wrenches are used which are not you want to purchase. Let's take another one at here! The impact wrench comes with the heavy-duty operation capacity with its greater torque speed. The nut busting speed of torque of the impact wrench will help you dealing with all types of driving jobs. One of the most useful benefits you will get from the impact wrench is the powerful torque speed which will help you performing the driving and the fastening tasks very easily. For the expert technicians, the impact wrench can be claimed as the most efficient tool to be owned because they can finish their jobs within a very short time whereas they would need a long time with the ordinary wrench. The price range has been set in such a way so that you can find it affordable within your budget. For performing removing and fastening tasks in the tighter areas, you can have no alternative to the impact wrenches. When you will go to buy the impact wrench at that time, you will try to look for the best cordless impact wrench. Therefore, you have to follow certain important and useful guidelines otherwise, you will not be able to purchase the right one for you. In the following description, we will describe some of the most important tips for you so that you can get the best impact wrench for you. The first thing you have to do is to check the torque speed of the cordless impact wrench you want to buy. In this case, you have to remember one very significant thing which is that it is the torque speed and breakaway torque of your wrench which will help you performing the removing and fastening tasks easily. If the torque speed is not that good, then you will not get anything done within the budgeted time of yours. So, you have to compare the torque speeds of the above impact wrenches before you go for buying any of the above. In order to get a durable and powerful motor, you have to check the motor of the impact wrench you are going to buy. The motor life matters a lot when it comes to the matter of the impact wrench you are going to buy. You can choose brushed motor or ﻿﻿brushless ﻿﻿motor type. In this case, you have to go for that impact wrench which comes with a durable and stable high-quality motor service. The next thing you have to do is to look for the components which will be included with the impact wrench. Different types of accessories are given in the box of the impact wrench which you will buy. Therefore, you should check those accessories before you go for buying it. The last thing you have to do in this case is to compare the prices of the available impact wrenches so that you can choose the right kind for you. Actually, everyone has their own budget while purchasing a new product. In the case of buying a new impact wrench, you also have to do the same thing which is to fix your budget. Fixing the budget will help you choosing the right kind of impact wrench from the above 5 which will help you fulfilling your job. Through the above review, we have tried to help you getting to know about the best cordless impact wrench so that you can purchase the right kind of impact wrench for you. It is always better to study reviews because it helps you to get the right one for you. For more information regarding the impact wrench, you can also search for many other websites on the internet.